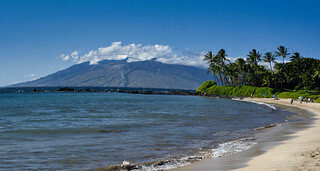 Palauea Beach, also known as White rock beach, is tucked away in a residential area between Makena and Wailea just south of Polo beach. This is yet another beach that is flanked by lava rock formations where fish congregate. Visibility varies, but's worth investigating if you're exploring snorkeling possibilities. The beach is mostly utilized by residents and may be less crowded than neighboring beaches on weekdays. Palauea Beach is about 300 yards long and has a gentle slope which makes for good swimming conditions when the ocean is calm..